Fifty inches of rain fell in 24 hours; now U.S. Disaster Relief is helping homeowners on Kauai. This is our first-ever response in Hawaii. UPDATE: Local volunteers have started work and those interested in joining us can find out more here. We completed our first work order on May 3. Samaritan’s Purse DC-8 aircraft arrived in Hawaii on May 2, delivering staff and supplies to help homeowners in Jesus’ Name after recent flooding. In partnership with community leaders, churches, and local volunteers, U.S. Disaster Relief is working in certain remote communities on the island of Kauai. Tons of supplies are being transferred to trucks and then all-terrain vehicles to reach areas still inaccessible by road. U.S. Congresswoman Tulsi Gabbard and Kauai Mayor Bernard Carvalho Jr. greeted the airplane on its arrival. Volunteers are cleaning out mud and debris from homes on Kauai, Hawaii. Much of Kauai's northern shore is a muddy mess. 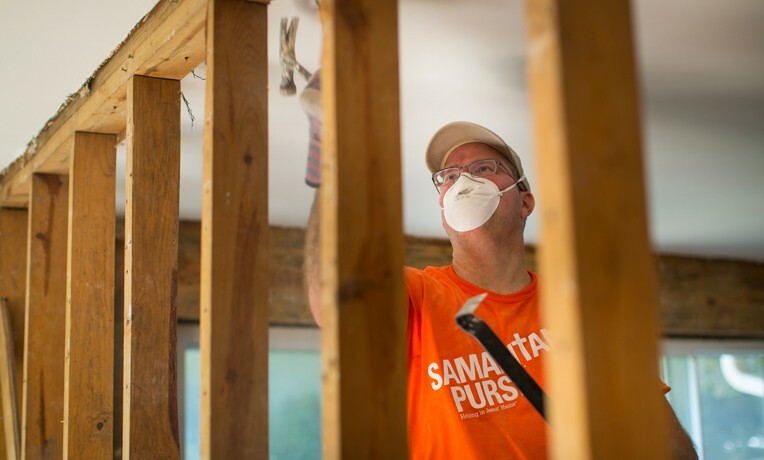 Samaritan's Purse teams are helping with clean up and repair. After helping to clear debris from Diane Ferry’s home, U.S. Disaster Relief volunteer Craig Rixon presents her with a Bible. Our DC-8, packed with supplies, arrived in Kauai on May 2. Our team unloaded relief supplies in Kauai. U.S. Congresswoman Tulsi Gabbard encourages Samaritan’s Purse volunteers and thanks them for their commitment to helping Kauai recover. Bernard Carvalho, Mayor of Kauai, welcomes Samaritan's Purse to the island. U.S. Disaster Relief volunteers gather for prayer in Kauai. Samaritan's Purse DC-8 lands in Hawaii. Pastor Steve Rex of Calvary Chapel North Shore read from Matthew 5 and encouraged volunteers in their work—praying for them and reminding them that they are the salt of the earth and light of the world. “God is behind all of this, and we want to give him all of the glory,” he said. Samaritan’s Purse has responded in Hawaii after parts of Kauai were inundated by nearly 50 inches of rain in a 24-hour period in mid-April. After being informed of the need by Congresswoman Gabbard, Franklin Graham traveled there April 26 to see the damage firsthand and begin the arduous task of helping homeowners recover after flooding. Franklin Graham unloads boxes of facemasks and Tyvek suits to give to a local community center in Hanalei, which will distribute them to families in need. To increase our capacity on the ground, our DC-8 aircraft flew from Greensboro to Hawaii on May 2 carrying a team of Samaritan’s Purse personnel along with a host of tools and supplies to help homeowners in Jesus’ Name. We are cleaning out recently flooded houses, sanitizing them, and then helping qualified families to repair their homes. Supplies on the plane included heavy-duty plastic tarp, generators, chainsaws, and other relief equipment. Franklin Graham was in Hawaii last week to assess flooding damage and met with Mayor Bernard Carvalho Jr.
Graham’s ministry played a key role in the mayor’s salvation. In 2015, God used a reporter’s question and PeaceWithGod.net, a part of Billy Graham Evangelistic Association’s Internet evangelism ministry, to bring Carvalho to faith in Jesus Christ. A few months later the mayor flew to Honolulu to attend Franklin Graham’s 2016 Decision America event where he was further encouraged in his faith. Read more about this story on the BGEA web site. We praise God that there were no reports of fatalities in the flooding, but the issues that some island homeowners now face are daunting. As they struggle toward recovery, pray that they would experience the love of Christ as our staff and local volunteer teams come alongside them. Hawaii marks the 36th state where U.S. Disaster Relief teams have responded. Note: A Will Graham Celebration, presented by the BGEA, is planned for Hawaii in March 2019. Editor’s note: This article was originally published on April 30, then revised and updated on May 1-4.